Experienced in handling TV, print, digital, direct marketing and PR, Prabhakaran has 18 years of practice in marketing and communications. He has managed brands such as Coca-Cola, Intel and IBM, as well as fashion and optical retail chains. 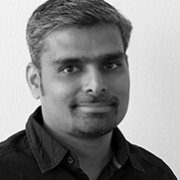 Since 2013, Prabhakaran works as an independent Business and Marketing Consultant and has executed digital and social campaigns for major clients, such as IBM and VMware. After obtaining a Post Graduate Diploma in Advertising from the Advertising Club Madras, Prabhakaran began working as a Brand Services Manager at Lowe, and was later an Account Manager at Euro RSCG and Account Supervisor at Ogilvy & Mather. Following his position as Event Manager at Intel, he branched off into marketing and in 2013 he founded his own agency. Prabhakaran has a remarkable academic career, teaching at numerous business schools. He is also a member of Harvard Business Review’s Advisory Council.